Posts in "Windows 2008 R2"
This requires that you have enabled the enable Active Directory Recycle Bin before you deleted the object. 1. Create a script file named list_deleted_users.ps1 and save it to C:\Script\. 3. Save the script file. 5. You will now have the output from the script in C:\Script\output.txt. To test the restore you can use –whatif. When you try to remove a name server in the name server tab in DNS Manager you get the question “Do you want to delete the glue record” and then DNS Manager stops responding/freezes. I got this problem on a Windows 2008 R2 SP1. Microsoft has a hotfix that solved my problem. Check out this link: DNS Management snap-in console stops responding when you edit the Name Servers tab in Windows Server 2008 R2. This will disable Adobe Flash auto update notification in Windows 2008 R2. Open regedit.exe and navigate to HKEY_LOCAL_MACHINE\SOFTWARE\Wow6432Node\JavaSoft\Java Update\Policy\. In Windows 2003 you had My Network Places on the desktop. There you could add network place, for example a ftp site. 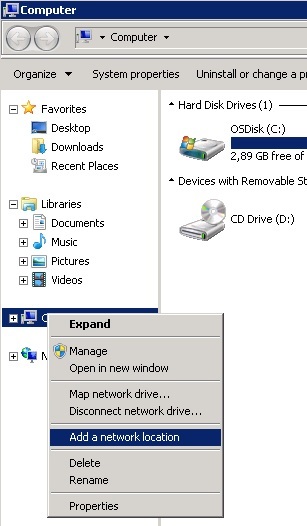 To add a ftp site i Windows 2008 R2 you need to right click on Computer and choose Add a network location.